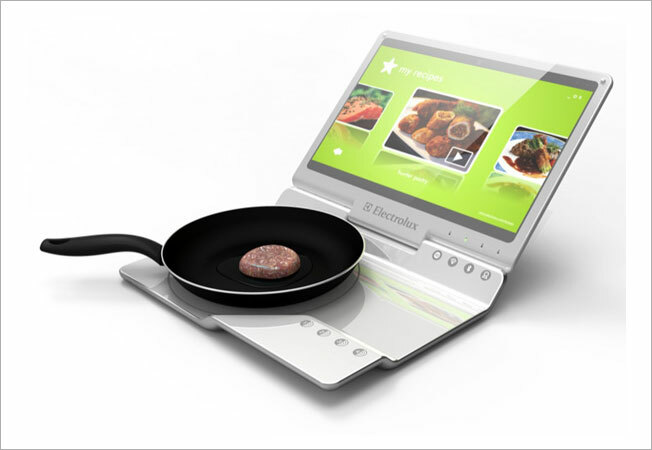 Dragan Trenchevski, an industrial designer from Macedonia with maybe the coolest name ever given to a person, has come up with a prototype for an Electrolux Mobile Kitchen, which is basically a laptop with a hotplate built into it—so you can easily cook while looking at recipes online. Well, it's a bit more upscale than that. The Mobile Kitchen is a touch-screen laptop that includes a four-tier induction cooktop, a cutting board and, one would imagine, a friendly reminder to wash/wipe off your hands before touching the screen. It's just a poop sock away from being complete enough for Google to install in every programmer's workstation. Obviously, any commercial release of such a product would have an uphill battle convincing people that just keeping their laptop or tablet in the kitchen is too inconvenient. But as a one-off novelty, it's pretty cool.